April 2013 view looking southeast: Upper New York Bay and Hudson River (foreground), Wallabout Bay and East River in the background. April 1981 view looking southwest: Wallabout Bay and East River (foreground), Hudson River (at right), Upper New York Bay (left) and Newark Bay in the distance. New York Harbor, part of the Port of New York and New Jersey, is at the mouth of the Hudson River where it empties into New York Bay and into the Atlantic Ocean at the East Coast of the United States. It is one of the largest natural harbors in the world. Although the United States Board on Geographic Names does not use the term, New York Harbor has important historical, governmental, commercial, and ecological usages. 1999 aerial photograph of the Upper New York Bay at the mouth of the Hudson River (left). The original population of the 16th century New York Harbor, the Lenape, used the waterways for fishing and travel. In 1524 Giovanni da Verrazzano anchored in what is now called The Narrows, the strait between Staten Island and Long Island that connects the Upper and Lower New York Bay, where he received a canoe party of Lenape. A party of his sailors may have taken on fresh water at a spring called "the watering place" on Staten Island—a monument stands in a tiny park on the corner of Bay Street and Victory Boulevard at the approximate spot—but Verrazzano's descriptions of the geography of the area are a bit ambiguous. It is fairly firmly held by historians that his ship anchored at the approximate location where the Verrazano-Narrows Bridge touches down in Brooklyn today. He also observed what he believed to be a large freshwater lake to the north (apparently Upper New York Bay). He apparently did not travel north to observe the existence of the Hudson River. In 1609 Henry Hudson entered the Harbor and explored a stretch of the river that now bears his name. His journey prompted others to explore the region and engage in trade with the local population. In 1624 the first permanent European settlement was started on Governors Island, and eight years later in Brooklyn; soon these were connected by ferry operation. 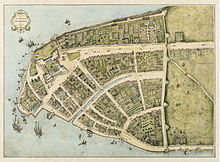 The colonial Dutch Director-General of New Netherland, Peter Stuyvesant, ordered construction of the first wharf on the Manhattan bank of the lower East River sheltered from winds and ice, which was completed late in 1648 and called Schreyers Hook Dock (near what is now Pearl and Broad Streets). This prepared New York as a leading port for the British colonies and then within the newly independent United States. In 1686, the British colonial officials gave the municipality control over the waterfront. In 1808, Lieutenant Thomas Gedney of the United States Coast Survey discovered a new, deeper channel through The Narrows into New York Harbor. Previously, the passage was complex and shallow enough that loaded ships would wait outside the harbor until high tide, to avoid running into the huge sandbar, which was interrupted in a number of places by channels of fairly shallow depth: 21 feet (6.4 m) at low tide and 33 feet (10 m) at high tide. Because of the difficulty of the navigation required, since 1694, New York had required all ships to be guided into the harbor by an experienced pilot. The new channel Gedney discovered was 2 feet (0.61 m) deeper, enough of an added margin that fully laden ships could come into the harbor even at slack tide. Gedney's Channel, as it came to be called, was also shorter than the previous channel, another benefit appreciated by the ship owners and the merchants they sold to. Gedney received the praise of the city, as well as an expensive silver service. In 1824 the first American drydock was completed on the East River. Because of its location and depth, the Port grew rapidly with the introduction of steamships; and then with the completion in 1825 of the Erie Canal New York became the most important transshipping port between the American interior and Europe as well as coastwise destinations. By about 1840, more passengers and a greater tonnage of cargo came through the port of New York than all other major harbors in the country combined and by 1900 it was one of the great international ports. The Morris Canal, carrying anthracite and freight from Pennsylvania through New Jersey to its terminus at the mouth of the Hudson in Jersey City. Portions in the harbor are now part of Liberty State Park. In 1870, the city established the Department of Docks to systematize waterfront development, with George B. McClellan as the first engineer in chief. By the turn of the 20th century numerous railroad terminals lined the western banks of the North River (Hudson River) in Hudson County, transporting passengers as well as freight from all over the United States. The freight was ferried across by the competing railroads with small fleets of towboats, barges, and 323 car floats, specially designed barges with rails so cars could be rolled on. New York subsidized this service which undercut rival ports. Major road improvements allowing for trucking and containerization diminished the need. The Statue of Liberty (Liberty Enlightening the World) stands on Liberty Island in the harbor, and the Statue of Liberty National Monument recalls the period of massive immigration to the United States at the turn of the 20th century. The main port of entry at Ellis Island processed 12 million arrivals from 1892 to 1954. While many stayed in the region, others spread across America, with more than 10 million leaving from the nearby Central Railroad of New Jersey Terminal. After the United States entered World War II, the German navy's Operation Drumbeat set the top U-boat aces loose against the merchant fleet in U.S. territorial waters in January 1942, starting the Second happy time. The U-boat captains were able to silhouette target ships against the glow of city lights, and attacked with relative impunity, in spite of U.S. naval concentrations within the Harbor. Casualties included the tankers Coimbria off Sandy Hook and Norness off Long Island. New York Harbor, as the major convoy embarkation point for the U.S., was effectively a staging area in the Battle of the Atlantic, with the U.S. Merchant Marine losses of 1 of 26 exceeding those of the other U.S. forces. Bright city lights made it easier for German U-boats to spot targets at night, but local officials resisted suggestions that they follow London's lead and blackout the lights of coastal cities. However, some lights were darkened, including those of the amusement parks in Coney Island, Brooklyn, and the Coney Island Light, and Sandy Hook Lighthouse. The Harbor reached its peak activity in March 1943, during World War II, with 543 ships at anchor, awaiting assignment to convoy or berthing (with as many as 426 seagoing vessel already at one of the 750 piers or docks). Eleven hundred warehouses with nearly 1.5 square miles (3.9 km2) of enclosed space served freight along with 575 tugboats and 39 active shipyards (perhaps most importantly New York Naval Shipyard founded 1801). With a staggering inventory of heavy equipment, this made New York Harbor the busiest in the world. Deterrence and investigation of criminal activity, especially relating to organized crime, is also the responsibility of the bi-state Waterfront Commission. The Commission was set up in 1953 (a year before the movie On the Waterfront), to combat labor racketeering. It is held that the Gambino crime family controlled the New York waterfront and the Genovese crime family controlled the New Jersey side. In 1984 the Teamsters local was put under Racketeer Influenced and Corrupt Organizations Act (RICO) trusteeship, and in 2005 a similar suit was brought against the International Longshoremen's Association local. In March 2006, the Port passenger facility was to be transferred to Dubai Ports World. There was considerable security controversy over the ownership by a foreign corporation, particularly Arabic, of a U.S. port operation, this in spite of the fact the current operator was the British-based P&O Ports, and the fact that Orient Overseas Investment Limited, a company dominated by a Chinese Communist official, has the operating contract for Howland Hook Marine Terminal. An additional concern is the U.S. Customs "green lane" program, in which trusted shippers have fewer containers inspected, providing easier access for contraband material. The Port of New York and New Jersey is the largest oil importing port and third largest container port in the nation. The commercial activity of the port of New York City, including the waterfronts of the five boroughs and nearby cities in New Jersey, since 1921 has been formalized under a single bi-state Port Authority of New York and New Jersey. Since the 1950s, the New York and Brooklyn commercial port has been almost completely eclipsed by the container ship facility at nearby Port Newark-Elizabeth Marine Terminal in Newark Bay, which is the largest such port on the Eastern Seaboard. The port has diminished in importance to passenger travel, but the Port Authority operates all three major airports in New York (La Guardia, built 1939 and JFK/Idlewild, built 1948) and Newark (built 1928). The harbor is still serviced by several cruise lines, commuter ferries, and tourist excursion boats. Although most ferry service is private, the Staten Island Ferry is operated by the New York City Department of Transportation. Passenger ship facilities are New York Passenger Ship Terminal, the Brooklyn Cruise Terminal at Red Hook, and MOTBY at Bayonne. ^ "Cross Harbor Freight Purogram - Studies & Reports - The Port Authority of NY & NJ". Crossharborstudy.com. September 11, 2001. Retrieved February 26, 2013. ^ "Replacement of Anchorage Channel Water Siphons". New York City Economic Development Commission. February 13, 2013. Retrieved March 15, 2012. ^ "How The Earth Was Made". © 1996-2011, A&E Television Networks, LLC. All Rights Reserved. Retrieved September 19, 2011. ^ Lighterage Controversy, Louis L. Jaffe, Mercer Beasley Law Review, v. 2, no. 2, p. 136–170, 1933. ^ U.S. Merchant Marine in World War II, U.S. Maritime Service Veterans, 1998–2006. ^ "Port in a Storm: The Port of New York in World War II", Joseph F. Meany Jr. et al., NY State Museum, 1992–1998. ^ Waterfront Commission of New York Harbor Archived September 19, 2006, at the Wayback Machine (WCNYH). ^ The RICO Trusteeships after Twenty Years Archived August 10, 2006, at the Wayback Machine, 2004, ABA, republished by Laborers for JUSTICE. US v. Local 560, et al. Archived August 13, 2006, at the Wayback Machine, Civil Action No. 82-689, US District of New Jersey, February 8, 1984. ^ Fact Sheet on Acquisition of P&O Ports by DP World Archived August 25, 2006, at the Wayback Machine, American Association of Port Authorities, 2006. Wikimedia Commons has media related to New York Harbor. New York Harbor Webcam Live streaming views from Staten Island using an HD-quality camera. New York and New Jersey Harbor United States Army Corps of Engineers, New York District. digging deeper in New York, Mechanical Engineering Magazine, November 2003. Cornell NY harbor tour summary, September 24, 2005. The Port Authority of New York and New Jersey by Dr. Jean-Paul Rodrigue, Dept. of Economics & Geography, Hofstra University, 1998–2006. Allied Convoys 1939–1945 map and tables by year of convoys (in German). This page was last edited on 17 April 2019, at 13:15 (UTC).